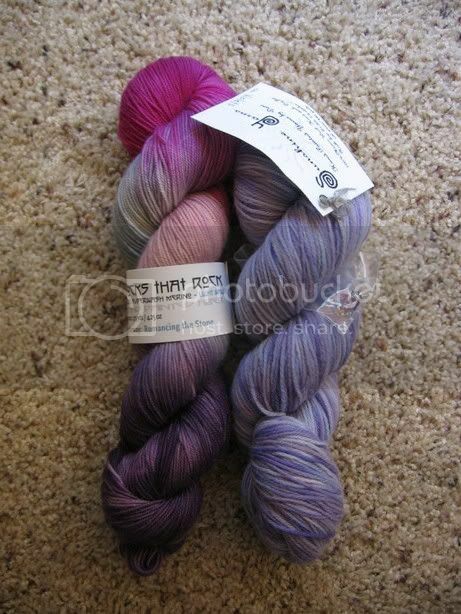 On the left is Socks That Rock in colorway Romancing the Stone, and on the right is Sunshine Yarns in colorway Violets. If I didn't already have a gazillion projects to complete in the next couple of months, I would totally be casting on with one of these right now. The colors are awesome and I love them. Thank you, Katya. You rock! Pattern is the Broadripple Socks on Knitty and the yarn is Cascade Fixation in color 9490. I love this yarn. Normally cotton yarns start hurting my hands because they just don't have any "give" but not this stuff. That little bit of elastic (1.7%) makes a huge difference and I would gladly work with this yarn again. I realize because of the angle of the picture, the socks look like they are 2 different sizes, but I promise they are the same. Now I'm working on 2 pairs of socks for the boy for his birthday in February. One will be Spiderman socks and the other Batman. I'm not at all sure I can pull this off, but I'm going to try. Hopefully I will have some pictures for you soon. And speaking of the boy, he's sick again today with vomiting and diarrhea. Hopefully it's just that 24 hour bug that he managed to miss right after Christmas, but sick seems to be the resounding theme around our house these days. At the very least it's some kind of record for us anyway. I can't wait for this bug season to end. I am seriously sick and tired of being sick. I now have what appears to be the remnants of a wicked head cold and I am not happy about it one bit. I started feeling a little run down and achy on Friday and I spent the majority of my weekend lying on the sofa. I have a lovely, hacking cough, but I am starting to feel a wee bit better. But this is it, you hear me? No more illness, please. I’m done. Three times in less than a month is enough. I had to rip out the sock I was making for my cousin because I was a fool to think that it would still fit even though I was making it so tightly. But I had PLENTY of time while convalescing this past weekend to start over and get damn near finished with one. I kitchenered the toe last night and then cast on for the other one. Woohoo! My son is apparently already having some issues with the baby. When I arrived to pick him up from daycare yesterday, his teacher told me she found him sobbing in a corner of the room and when she asked what was wrong he said, “Mommy’s home with the baby.” She misunderstood at first and thought I had already had the baby and when she said, “Your mom had the baby?” he replied, “Yes, mommy’s home with the baby.” Then she realized that it was way too early and she asked, “Wait, is the baby still in mommy’s tummy?” he said, “Yes. And mommy’s home with the baby.” She comforted him and he eventually calmed down and went back to playing, but this really alarmed me. I tried to talk to him about it last night and we spent lots of extra time last night snuggling and spending quality time together so that he will hopefully feel more secure about the whole baby situation. I suspect this is just the first of many issues we will deal with. I look like I’m 40 weeks pregnant instead of 25. I’m already having moments of incontinence, especially when I cough or sneeze. And I’m coughing a lot (see #1). At this point there’s no way I could do enough kegel exercises to help. For the first few weeks after I had my son, my body wouldn’t give me any advance warning of the urge to pee. It was like, “Hey, I need to – oh crap, I’m peeing.” I lost track of how many urine puddles/trails my husband cleaned up during that time. And he never complained once. That’s true love right there. Many of you may have known that I had been training for the Houston Half Marathon since August. But, what you didn't know (and neither did I), is that I could and would actually accomplish that lofty goal! I know what you're thinking... there is no way Kim could run 13.1 miles!? And let me tell you - I wasn't so sure I could do it either. But bit-by-bit and mile-by-mile I kept inching toward that goal until I conquered it. In August, I joined a group of INSANE people that meet on Saturday mornings to train together and support one another. That was great, when they met at 7:00, but the meeting times kept getting earlier and earlier until finally I was getting up at 4:30 in the morning to meet them at 5:00. Running... at 5:00am... on Saturday mornings!!! Can you believe I stuck with that plan?! We ran in the blistering heat (remember...it's hot in Houston even at 5:00 and 6:00 am), the outrageous humidity, and the pouring rain. But, I witnessed some of the most beautiful sunrises, I met some wonderfully encouraging friends, and I discovered something deep inside of myself...strength and determination. I would have to say that completing the half marathon is one of my most treasured experiences. I also believe that my children learned a valuable lesson from the sideline. They watched me set a goal, they saw that it took a lot of hard work and they saw that it was SO WORTH IT!!!! Crossing that finish line (even though I felt like quitting at mile 7, and 9 and definitely at mile 12) sent me through a range of emotions. I just can't help but think how good it would feel to complete a full MARATHON! Maybe I'll write to you next January and let you know. " Yesterday we found out both my husband and son have strep. I did my best to stay away from both of them last night, even so far as sleeping downstairs on the sofa. But unfortunately I couldn’t turn off the maternal mind-set and even though the boy was upstairs, I heard every cough, every time he got out of bed, and I heard him when he cried for me. His dad isn’t blessed with this mind-set and heard nothing. I will give him a break this time since he’s sick too, but he probably wouldn’t hear him under normal circumstances. I went upstairs and tried to wake him and tell him that his child was lying on the floor in the bathroom with his head next to a little pink puke bucket (God bless him, he doesn’t want to make a mess on the floor), but he mumbled something unintelligible and went right back to sleep. So I comforted the little guy and put him back to bed. And now I am tired. No sleep. When I talked to my husband this morning he apologized, but he said I need to stay away from them tonight and get a good night’s sleep. I tried to explain how I can’t NOT respond when my child is sick and crying for me (especially when his father doesn’t even wake up because he’s sick too), but he just doesn’t get it. And I’m just hoping and praying that I don’t get strep too because I can’t stay away. We’re not starting off the year on a very healthy note, are we? Update on my cousin’s socks: I got the yarn and cast on for the Broadripple Socks on Knitty. I’m using Cascade Fixation in color 9490 Parfait, and it’s much more suited to my cousin. I noticed yesterday that the colors in my sock seem to be pooling, whereas the model in the pattern photo doesn’t. I checked my gauge. Aha, there’s the problem. Gauge is supposed to be 7 stitches per inch and I’m getting 9 because I knit too damn tightly. But despite that, I think the sock will still work because my cousin is so tiny. The pattern says it should fit a woman’s medium foot and I would say my cousin is a woman’s small so I’m just going to keep knitting and not worry about it. If it doesn't work, she can give them to her daughter and I'll eventually knit her another pair. And in the future I will work on relaxing a little bit while I knit and maybe I will actually get the gauge I’m supposed to. And speaking of gauge, I admitted something funny to someone the other day. You know how when you are looking at a pattern and it will give you the number of stitches per 4” or 10cm? Well, even though I’ve been knitting for about a year and a half and I have looked at oodles of patterns, it finally dawned on me that gauge is how much a woman dilates to have a baby. Maybe I came to this realization because I’m pregnant and I’ve had labor and delivery on my brain for a couple of months now, but now every time I read another pattern I’m like, “Holy CRAP! 10cm is NOT VERY BIG!! !” It’s not anywhere NEAR big enough to accommodate a baby’s head! No wonder having a baby is so painful. Thank God for epidurals. I told a lie the other day. I was on the phone with my cousin and describing the various sock yarn in my stash and giving her color choices for a pair of socks. In my hands I had some nice Koigu that honestly, were the perfect colors for her: pale pastels in pink, purple and blue. But when she asked me if I had anything with pink in it, I suddenly realized how perfect the yarn would be for my baby girl. I could SEE my baby girl wearing something made from this yarn. And doesn’t my baby deserve Koigu? So I lied and said no. Will I go to hell for being a selfish yarn whore? I thought I found something my cousin might like out of the rest of my stash and I started a pair of socks for her, and then I realized today that these colors are just not right. So out of guilt I have decided to break my resolution about only knitting from my stash so I can buy something more suitable for my cousin. And then my buddy KatyaR emails me and tells me she will be going to Guthrie for a funeral and will be stopping by SWAK and wondered if I needed anything. So you see, it was fate. And now I will have 2 socks started and waiting on the needles while I make the pair for my cousin. 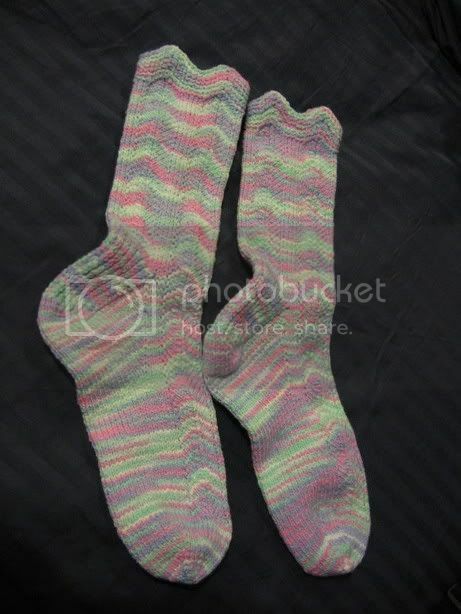 Plus I want to make the kiddo a couple of pairs of socks for his birthday towards the end of February. This is so typical of me. I make grand plans about the things I want to accomplish and in the end, well, you can imagine how the story usually ends. Whew – what a way to wrap up the year. Christmas was wonderful and no family members were harmed, which is a plus. My mom came up from the Eufaula area and gave us, among other things, a stomach bug for Christmas. Even my in-laws got it. Fortunately, it was only a 24 hour bug and amazingly, the kiddo did not get it. But oh my, I haven’t thrown up that much in a LONG time. Not fun. As soon as I started feeling better, I went shopping with KatyaR and we hit a couple of yarn shops and a few wine shops. I miss wine… Then guess what fun thing the hubby and I did to ring in the New Year? We tiled the floor! Woohoo – the fun never stops at our house. Of course, we didn’t finish. We never do. There are just too many projects to do and not enough time to do them. But hey, I can now say that I know how to use a trowel, so that’s something, right? 2. Become a better, more patient parent. 3. Become a better, more patient spouse. 4. Become more organized in every aspect of my life. 5. Work on my scrapbooks more to preserve those memories that I am so good at forgetting. 6. Try to eat healthier and exercise more. 7. Try to set better examples for my kid(s). 9. Try to be a happier person no matter what. 10. Try to be more active and less lazy in every aspect of my life. No matter what your resolutions are, I wish everyone the very best in 2006. And to KatyaR, you are very much missed here, but I hope you are loving your new job.